Back when I completed the Artist Way (AW) for my very first time my world opened up to self-care practices that I was not accustomed to. I had been thinking to myself at the time that I would really like a massage. A couple years before that I had strained my back and received a few sessions of massage with chiropractic care. My back felt pretty good for a while and then began to give me pain once again. I think of basic self-care as air. If it is not in place, it is hard to even imagine more creative activities to do. For me, the basic needs must be met before I can really relax and receive the “magic” from the Artist’s Date (AD) experience. So, when I began the AW, my mind wandered to wanting to get back into massage therapy if at all possible. I opened my phone book to a random place and there was a coupon for a free massage with a chiropractic exam. The location was a little out of the way (20 miles to the north), but since I was looking for adventure anyway I called and made an appointment. This was when I had my first serendipitous experience on an the AD. At the time I had been focusing efforts on fictional writing. Each person at the chiropractor’s office had such interesting and distinctive character that I felt like I was in some kind of dream. I had such a fun time imagining them as characters in my own story. This time around, my week 5 date desire was once again to pamper myself a with a massage (my back had been letting me know that it needed care). I had a referral from a friend for a therapist that was located close to my work, so I looked her up online. Her practice was called Elemental Energy Massage. I wondered what this meant and found that in addition to regular massage techniques, she also had more eastern practices offered such as Thai compress massage. One of the the techniques offered was Japanese Reiki energy healing incorporated with massage. I felt like being adventurous, so I asked her about her special (which actually was the Thai compress massage) and she ended up thinking that I was asking about the Reiki energy healing massage. Even with the mix up I was in for a very interesting experience. Many times when I come out of a massage, I am so relaxed that I border on lethargic. This was not the case with the energy work and massage. I came out feeling a relief from my pain, but also very alert and ready to tackle the remainder of my day. I went for my first pedicure with one of my early AD back my first time through the AW as well and was sold on the practice. For the price that you pay, the result is so dramatic. Pretty and healthy feeling feet are a necessity once you get into the practice. Unfortunately, if you get low on time or funds they are one of the first rituals up for elimination. I hadn’t been for a pedicure in over six months when week 6 rolled around this time, and I decided that I could strain my mind trying to come up with a great AD or I could do what my body was begging from me.. a little foot care. It was Valentine’s Day and I knew that I could rationalize a special treat. When I arrived, the nail place was empty except for one other customer (which immediately put me at ease). The price was so reasonable that I threw in a manicure as well. I relaxed and enjoyed the process. On that date, I established a rule of no cell phone use. I considered the more recent loss of social etiquette in society when it comes to being attentive and present while with others at the eating table and out for special time. I slowed down and enjoyed being in the moment. When leaving, I felt like a million bucks, loved, and treated on a holiday that can sometimes be a letdown. Immediately following, I shopped for Valentine gifts for my husband and kids. It is so much easier to be giving when you feel like your own needs are met. So, now that my self-care is up, I am excited to see what adventure is in store for next week! 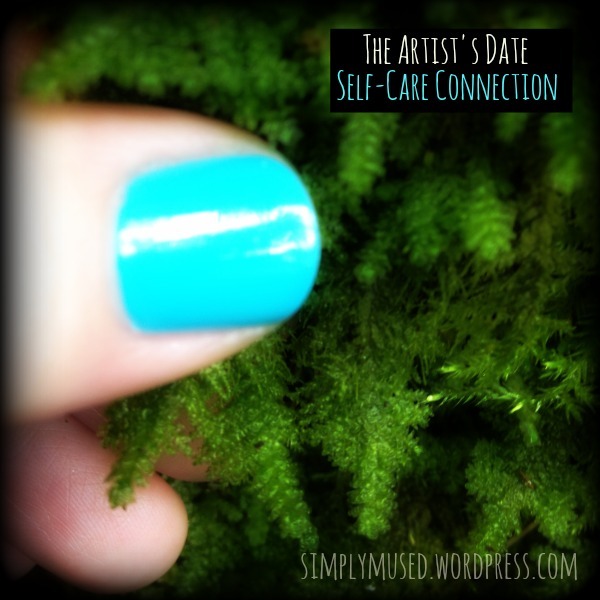 This entry was posted in Artist's Date and tagged art, creativity, energy healing, massage, self-care, the artist's date. Bookmark the permalink.